Join the discussion on our forums! Come discuss Beast King over in our dedicated Beast King discussion topic. Feeling lucky ? Then add in a Master's Call at Turn 3 to grab three guaranteed beasts, who'll enjoy a nice and plump boost to their stats. You could also do a Untamed Beastmaster + Master's Call at Turn 6 (or Turn 5 with a coin) for similar results. Can anyone confirm me if your opponent sees if a card gets buffed by this minion? Is the voice of this the same as the innkeeper? 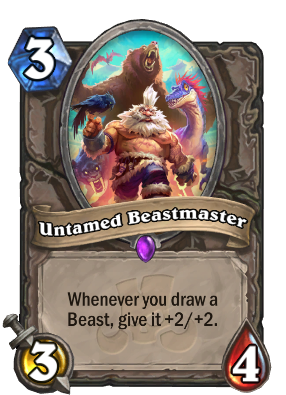 If an opponent has Untamed Beastmaster, and he draws a beast later on - the beast that is being drawn will be revealed to me and show the buff animation? Playing against this card, there is an animation when the opponent draws a beast but no evidence in the history bar. Intended? Ehrm, Hearthpwn staff? Maybe "Beast King" was some temporary name, or on-the-fly translation from whatever language was spoken in the reveal, dunno. But could you please update this text now? This gonna be one of the best cards this expansion. Yay a vanila statline with an additional benefit. So people can be tamed too? Just a language question. Does he command untamed beasts? Or is the beastmaster himself untamed? This has the hunter quest written all over it. He looks like Karl Marx. The beasts have nothing to lose but their chains. They have a cardboard to win. Beasts of all expansions, unite! Pretty okay stats with cool effect. It won't even hurt to play this as plain 3 drop if needed board presence. We will get a lot new beasts this expansion which might be the number it needs to spawn a beast centered deck. King of Beasts got dethroned.